Sooooo....about 20 days have gone by since I last posted. I thought it had only been a week, maybe two. I've pretty much determined I can't keep up with anything, except feeding my family. And some days it comes down to the last minute with that! There's always toast. Well, maybe. We are no longer buying bread...so that means if I don't make it...we don't have it. Yes, I'm making all our bread now. I use to keep a loaf of store bought in the freezer for back-up, but then I got lazy about making bread when I had a backup. I have no idea why I'm writing this. This is suppose to be about school and it really doesn't matter whether I make bread or not. Except that is where some of my time goes....feeding my family whole foods. We've been slowly ditching boxed and processed stuff at home and we're pretty much there (except for cereal, some healthy snacks, and the occasional Dr. Pepper). But that doesn't mean we won't eat it, you can still feed it to us if we come over. Oh, we just bought our first packages of Ramen in forever, so there's some packaged stuff in the pantry. The kids have never had it and are looking forward to trying it when we study Japan. Oh...we lived on that stuff in our early married days when money was tight. Ramen, Hamburger Helper, and cheap frozen pizzas. The kids had no idea what Hamburger Helper was. They also don't know what Twinkies are. They live such a sheltered life (except they know what mangoes, avocados, brussel sprouts, pomegranates, quinoa, and chia seeds are...but not chia pets!). Goodness...back to school. I really need to make some bread tomorrow. Sourdough is easy (once you have a starter), except the kids eat a loaf up in one day, they like it that much. It is really good. Aargh...back to school. I have no idea where we're at and I'm pretty sure I'm lacking on the photos. Let me go look in my harddrive. I found a couple. We entered Saudi Arabia. I don't really remember a whole lot about it. I hope the kids remember more than I do. We've been slacking on the art. Well, I've been letting the boy slack as long as he practices his guitar. The girl has been crafting like crazy. 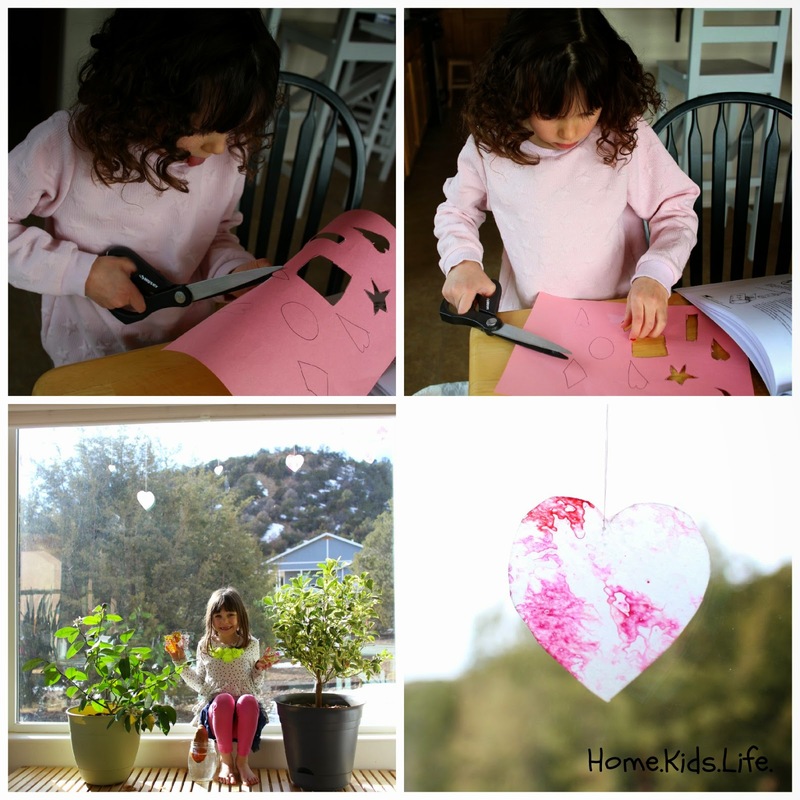 She made melted crayon wax paper hearts for Valentine's decorations. Then she made a tissue paper lantern out of the Global Art book. She's a crafting fiend. Her brother even got her a Martha Stewart Holiday Crafting Book for Christmas. That's where the heart idea came from. In our other viewing, we watched two episodes of the Magic School Bus. We saw "Sees Stars" and "Gains Weight." The kids have not been real impressed with science this year. I think most kids would like it, but compared to all the experiments we did last year...mine are not thrilled with this year. They don't think there are enough fun experiments. They have a science teacher mama to blame for that. To be fair, the curriculum has one about every other week, but my kids were use to 1 or 2 a week. So this crazy science teacher homeschooling mama is writing a life science curriculum for next year with loads of hands on stuff. I hope I can finish it, I didn't do so well finishing my last one! Yes, I'm a wee bit busy and staying up past my bedtime a lot. Still in Saudi Arabia. Oh, we built some Nanoblocks this week. No photographic evidence. The kids built a Banyan Tree. That puppy was little frustrating at first. I had to even get in there and help get the base put together. But we did it! Cooking at the end of this week was hummus, but the kids are pretty familiar with hummus. They've been having it since they were wee little things. They're just waiting for the ramen, though we'll probably try some other (more authentic) Japanese food also. I am fairly confident that we skipped art this week. The girl crafted on her own. We viewed the Magic School Bus episode of "Makes a Stink." I think we had a ski weekend in there too, somewhere. Whew. I'm stubborn enough to keep up these weekly reports, but I just don't have my heart in it anymore. Less than 60 days of school left and I'm already planning next year. We figure things out more and more each year. I am enjoying the time with my kids and wouldn't trade it for anything. 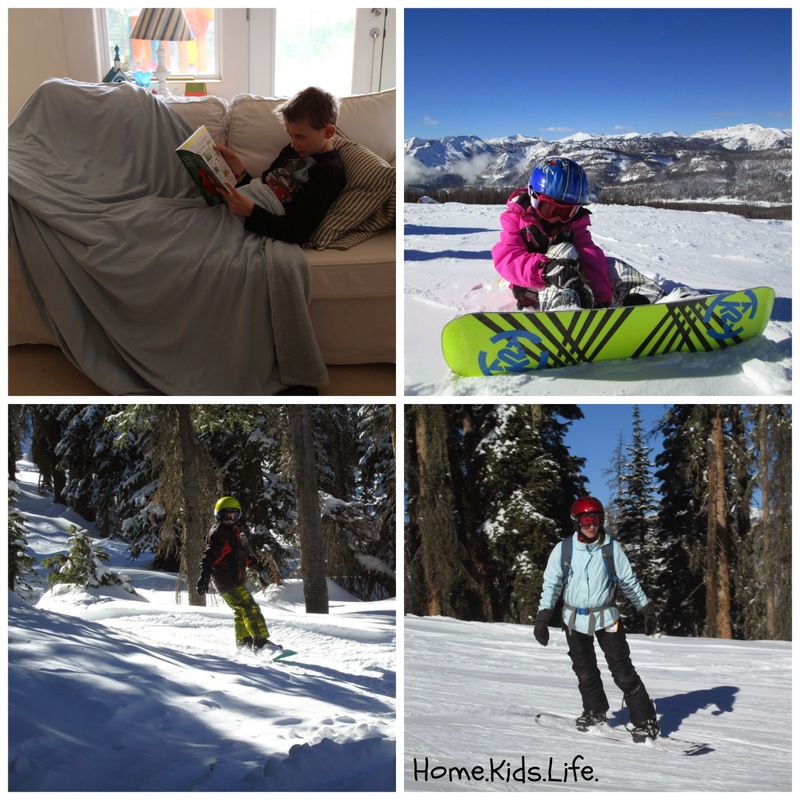 So less blog posts, but more kiddo time is a win. And I'll still document our school stuff as time allows, so someday they can look back on it and tease me about it (or I can tease them). They are pretty incredible kids and I'm lucky they let me teach them! Where is your time going lately? Fast?